1. Make frequent back ups of your PowerSDR database. You never know when you might need to roll back to a previous working configuration or when your rig/software decides to go south. 2. You can have more than one version of PowerSDR installed. ONLY one can be active. When a new version of OpenHPSDR mRXPS comes out, make the old version inactive and install the new. That way if there is a bug or you want to know what your configuration was you can swap active versions. 3. Screen capture your current configuration, highlight what you changed from the default install and save in a WORD doc. This might sound like a lot of work but it will pay off later on. This is the ONLY guaranteed safe and reliable method. It’s NOT a perfect tool and you will still need to reference you previous configurations (see step 3 above). Another potential problem is changes between databases of different versions which you did not catch. You might introduce problems with bad configurations and start reporting these problems of your making on this forum! Use at your OWN RISK! 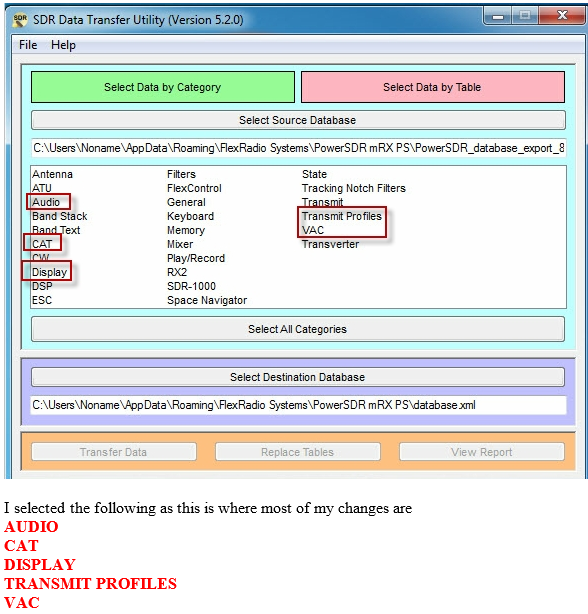 Here is an example of what data to transfer between versions.